Convention season is in full swing, and CONvergence is quickly approaching. For many, this is their first or second time. Others of us are seasoned congoers. But no matter who you are, this book is for you. 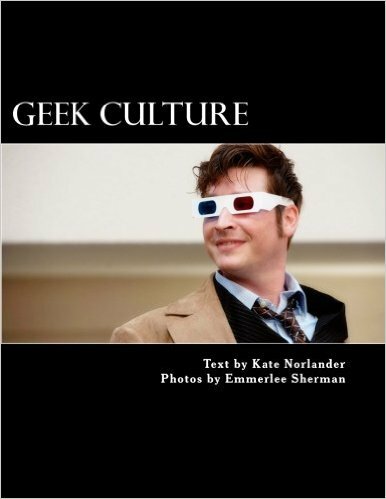 Kate Norlander has written a coffee-table book called Geek Culture that looks back on CONvergence 2013, “British Invasion.” It features beautiful photos taken by Emmerlee Sherman and covers every facet of CONvergence, from the long ticket lines to early-morning yoga with YogaQuest. The book starts out with a brief history of the con and what it is, then moves on to costuming, the masquerade ball, and then panels. From there it covers the party rooms and unconventional events, and it ends with a spot on Harmonic CONvergence. In this delightful narrative you get to meet a few of the attendees, looking into what they do and why they do it. The book is written with the enthusiasm that every geek feels when they see the tall tower of the Radison. (Or is it the DoubleTree? Or the Sheraton? I forget.) The first major event that is featured is the masquerade ball. From the orientation, Kate captures how this event works. You learn of what makes these people enter, where there inspiration came from. There are some wonderful interviews with participants Bill Hendricks and the Lady Doctors. You learn how much these congoers put into their craft and the amount of dedication that they have. It is amazing some of the costumes you will see at the masquerade. From there, we move on to panels. Kate talks about how a panel is created—the “behind the scenes” of brainstorming a panel for CONvergence—and goes over a particular panel, “Movie Sweding and You.” With the panels, it is hard to put a strict expectation on what is going to happen, but she does a very good job at showing what an average panel is all about. There are so many different subjects, it is overwhelming to pick; discussing three panels in particular, she notes that they are only “three examples from the 30 options during the first three hours of programming.” Just from this sentence you know that there is something for everyone. After panels, we get a look at the different party rooms that were around in 2013, most of which are still around today: Ochaya, the peaceful, alcohol-free room where people can come and sit and find a reprieve from the loud, crowded cabana area. House of Toast, which famously serves toast with 130 condiments to choose from. The Snack Food Glory Hole, a place where you have no idea what will be fed to you. The pictures that Emerlee captured will make you hungry. Other rooms featured are Worship the Goddess room, which is currently on break; the Brass Falcon Airship, a steampunk-themed party room; and the IKV RakeHell and USS Nokomis, the much-loved Star Trek–themed rooms. Finally, the author makes sure to go over the different types of things that go on around CONvergence, such as the annual Bat’leth Tournament, YogaQuest and Harmonic CONvergence. ChessWorks will be there this year to allow you to battle with oversized chess pieces. Throughout this book you will see a number of blue boxes. These are side notes used to inform geeks and nongeeks alike about elements of our culture: furries, Geek Physique, “fake geek girls,” and plenty of other subjects. They are well done and give you a good background on the geek culture. In this book, Kate has perfectly captured what CONvergence is. Geek Culture is a delightful book. It is light reading that keeps you amused, and the pictures by Emmerlee are amazing—they truly capture the fun that we have. Both the text and the images bring to life the friendships that are created at CONvergence. If you’ve attended before, it is a great book to relive your memories throughout the year, even if you weren’t there in 2013. If you’ve never been, it is a great way to learn about the convention. I know I will page through it and read more when I am getting my six-month itch to go to CON! I’ll definitely have to read this soon! Convergence 2013 was the first con that I attended so it has a special place in my heart. I love that someone wrote about the attendees, that’s super cool!